This is a very different look at Christianity from how it is commonly understood. It says that Christianity is not so much a historical faith of God’s actual dealings with mankind; it is mythological in character, telling a story with symbols – a story that is told, not just in Christianity, but in the core teachings of all of the world’s religions. I suppose you might call this Mystic Christianity. The idea is that you have to get past all the dross of conventional religion to find the nuggets of truth that are intuited at the heart. Is there anything to this notion? Well, yes, at least to a degree. For instance, consider the prevalence of the number 12: twelve tribes of Israel, twelve disciples of Christ, etc. The significance of this is the twelve months of the year, with the sun (Jesus) at the centre. The notion of the incarnation (God becoming man) is viewed, not as a historic event that happened once for all time, but as a symbol of the divine and earthly natures of all men. We are all both God and creature. To comprehend this, you have to appreciate consciousness as something more profound than how it is considered within the constraints of materialistic science. Before reading this book, I was already in touch with hints of what Watts’ explains. The idea of God having two natures (Father and Son) was not as absurd to me as it is to most atheists, because I had already come to appreciate that consciousness has metaphysical roots that are non-dual. There is little-me here in the material realm and big-me running the show from beyond space-time. But both are me. While this was an interesting read, and by far the strangest book on Christianity I’ve delved into, I’m not sold on the idea that there is any value to be had in attempting to restore Christianity to some sort of mystic relevance. Christianity, for the most part, has long been interpreted as a historical record of God’s dealings with mankind. The idea of convincing the world that it is better treated symbolically can only happen after the world has been convinced that it is non-historical – at any which point ex-believers will be disenchanted at having been conned all their lives and will have no wish to translate the fictions of their imprisonment into symbols of genuine metaphysical worth. At least, that’s how being an ex-Christian makes me feel. Perhaps Watts’ approach to Christianity will have some relevance to a lapsed Catholic who has been trying long and hard to make something good out of it. I personally feel that the way forward for metaphysics is to lose all religious and spiritual garb and to integrate with modern scientific language. For instance, understanding man as the Infinite focused to a point of limited awareness within space-time. That works a lot better for me than talking about man realising his godhood through his union with Christ the God-man. An interesting and unique book, packed with a staggering amout of research by way of footnotes. But ultimately of no more value than a historical curiosity. My guess is that only one in every hundred Christians takes the time to look into the foundation of their religion in any detail. 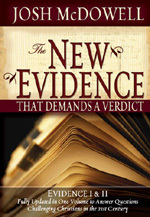 Josh McDowell’s book, The New Evidence that Demands a Verdict, is written for such conscientious students, who wish to be able to hold a rational case for their faith when under fire from sceptics. The book also serves as a great information source for anyone, whether sceptic or believer, who wishes to become more informed about Christianity. It is a titanic work of around seven hundred pages. Even that figure is deceptive, because if not for the dual-columns and tiny typeface, this book would be more like a thousand pages. The “New” of the title relates to the the book’s prior publication as a smaller edition, with a later sequel. Both volumes are now brought together as one, with revisions. I approached this work as a sceptic, but as an open-minded sceptic who is willing to be changed by what he reads, not as one who is simply aiming to reinforce his scepticism. Although I was confident in my stance, I still had many gaps in my knowledge about Christianity. I’m happy to say that I now know a great deal more, and I’ve had some of my opinions changed, as a result of reading. Beforehand, I tended to view the person of Jesus as someone who had no historical substance, but now I’m quite confident that there was an influential first-century figure who had followers and who was executed for his religious troublemaking. As I was reading, I was trying to ascertain where the real crux of the case for Christ lay. It’s essentially this: what should we do when we come across the presence of the supernatural in a historical text? The sceptic may say, “This is contrary to experience, therefore unhistorical,” whereas Josh McDowell maintains (and I paraphrase), “We must treat all historical texts on equal terms, without judging the value of a text based on an anti-supernatural bias.” I maintain that both approaches are extremes. If the supernatural really had invaded human experience in the distant past, the sceptic’s view is so restrictive that nothing could ever prove this to him. Meanwhile, McDowell relies on an overly simplistic stance on what is essentially historical probability, not fact. A more reasonable attitude would be that when we encounter the supernatural in ancient history, it is a legitimate warning bell that we may be reading something legendary, and so the standard for evidence naturally rises beyond what we would ordinarily demand. Good evidence for something as extreme as the resurrection of Jesus would be corroboration from multiple secular sources of the same time period. But we do not have this; we only have the Gospel accounts of the Christians. One source for the historicity of Jesus, the Roman historian Tacitus, takes a sceptical stance to Christianity, calling it a “mischievous superstition.” McDowell never draws attention to this pertinent fact, only attempts to use Tacitus’s mention of Jesus as a proof for his life in general. This shows the one-sided bias in his approach. The size of this book is a bit daunting, but in retrospect there’s a lot less in here than one might assume. Fifty percent or more of the volume is taken up by quotes. This makes it quite repetitive at times, as McDowell often cites lengthy sections by three or four Christian apologists, who are all covering the same ground. Worse still, some of the material is repeated in different chapters. There is also a massive reliance on rhetoric to back up evidence that is fairly flimsy, rather than a straightforward presentation of facts with the onus put on the reader to draw his own conclusions. While the focus of the book is an attempt to establish the validity of the Bible as both a historical document and the “word of God,” there is a large part at the tail end tackling postmodernism and Eastern mysticism. These are included because the author sees them as contemporary threats to Christianity, but I think a far more important subject to tackle would have been the theory of evolution. It’s certainly far more influential in the West than Zen Buddhism! Evolution renders man’s “sinful nature” as null and void, because it sees all our behaviours as part of our evolutionary heritage, tracing our nastier base instincts to the reptilian brain. And if there is no sinful nature, then there is no need for redemption. So, evolution is one of the greatest threats to the survival of Christianity in the modern world. Yet the book contains nothing more than one passing mention of the topic in the introduction. In other words: “I can’t prove Jesus rose from the dead, but hey, you can’t disprove it either!” The fact that McDowell saw fit to quote something so logically fallacious demonstrates the weakness of his own thinking. Any rational thinker knows that one does not have to disprove something. The burden of proof lies upon the one making the astounding claim. Atheists who consistently try to live without God tend to commit suicide or go insane. I advise anyone interested in Christianity to read this volume, in an open-minded but critical spirit, watching out for those weak arguments that sound good until properly examined. 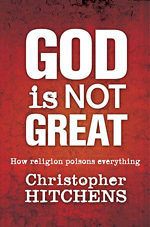 I remain confident that Christianity is a false religion, moreso after reading The New Evidence that Demands a Verdict. When all is said and done, the choice of whether to believe in Christianity boils down to how much you want or need to believe and how easily you accept the supernatural in the absence of direct experience or concrete evidence. For me, reading this book puts the final nail in the coffin of Christianity. Case closed. Christopher Hitchens, recently deceased, was one of the most well known defenders of atheism, and probably needs no introduction. He was a lively and passionate speaker, able to put religion in its place with sharp wit and a startling economy of words. Never one to back down from a fight, he displayed a fierce disregard for any heckling from debaters or audiences. He never attacked religion from an overly intellectual philosophical point of view, but made his case against it on the grounds of a thorough knowledge of the horror that religion has been responsible for throughout mankind’s history. All of this made him, in my estimation, the most popular and entertaining atheist to listen to. Hard to compare him to Dawkins, since they each have a different area of expertise. Hitchens insists on dropping the capital “G” from the word God throughout the book, which is disappointing to me. I’m no fan of religion, but there is philosophical merit to the idea of God, whether understood deistically or pantheistically. There is nothing poisonous about metaphysics. My personal favourite term for the creative agent of the universe is the Infinite, and I always spell it with a capital “I”, purely in reference to its metaphysical nature. And I do not think of the Infinite as a transcendental entity, like the monotheistic religions. The most disappointing aspect of the book was the slightly hypocritical note on which it closes. After earlier praising pluralism and free speech, Hitchens finishes by saying that we need a new Enlightenment and religion must be excluded from all discussion. How tyrannical of him to decide that for us all. Organised religion might one day die of its own accord, but I doubt that will bring an end to organised stupidity and intolerance. Those unfortunate human traits will simply find a new means of expression. Hitchens’ critique of religion is, for the most part, valid. It just doesn’t quite reach the heart of the matter. God Is Not Great is a very useful book. An important catalogue of the misuse of religion throughout history.